Favorite Nail Trend: Anything sparkly! 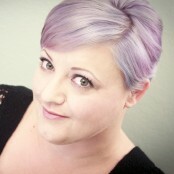 My name is Sherri, and I love doing nails! I grew up in a family that was pretty artistic, and that quality was passed on to me. It’s a quality that grounds me, restores me, and keeps me happy and bubbly. It wasn’t until later in life that I found out that my medium wasn’t canvas, but nails. It’s fun and quirky, which compliments my personality perfectly. I think steampunk is one of the coolest genres ever. I was so happy when we received this challenge. I absolutely adore the Victorian era, so anything that can build on that is perfect. 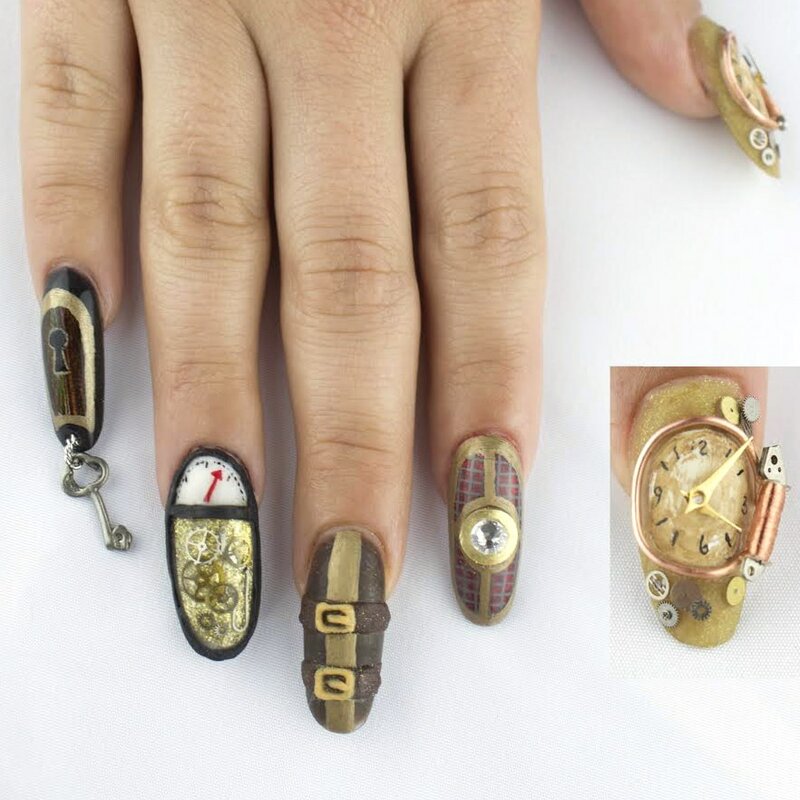 With steampunk there was so much I wanted to say, so this week I gave each nail its own story. Unlocked Potential — Using a real beetle wing as the base, I created a lock. I dangled a key on the tip to unlock the potential we all have inside of us in this competition. Under Pressure — This competition comes with a lot of pressure to perform, so I had to have a pressure gage! As the pressure builds, the gears turn, moving the needle higher and higher up the pressure gauge. Buckled Down — Leather and metal just go together, don’t you think? This nail represents buckling down, and getting each challenge done, even when things don’t go exactly as planned. Steampunk Iron Man — When I was looking at steampunk pictures, I came across a steampunk Ironman costume from Comic Con. My husband practically begged me to put that in this week’s challenge somehow. Since he has been my biggest supporter in this competition, I had to work a little bit of him into this challenge. Fighting the Clock — Clocks, gears, cogs, and copper. 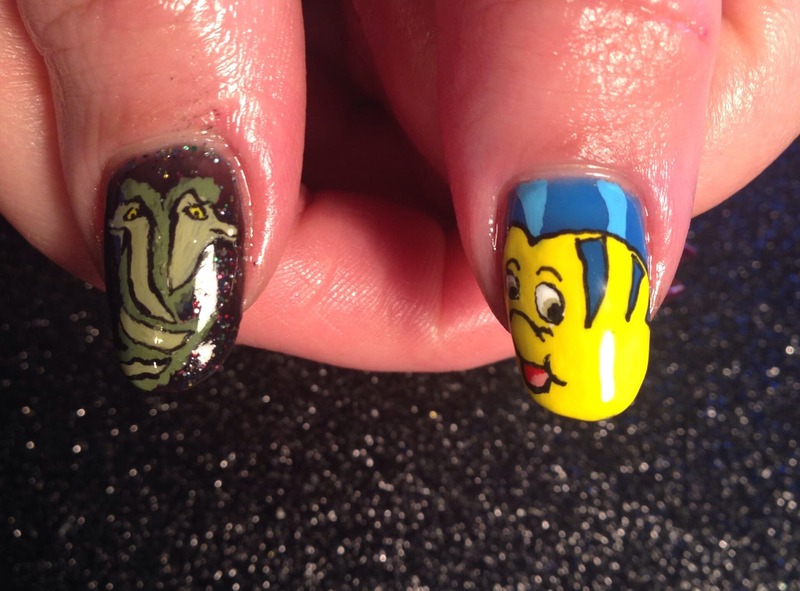 They all had to come together on this nail to make it tick. In this competition, and in life, fighting the clock can be a very chaotic experience. I wanted to recreate that emotion on this nail by forming the clock out of “junk”, and purposely leaving things disjointed to convey the anxiety that comes from having too little time to do all the things you want. 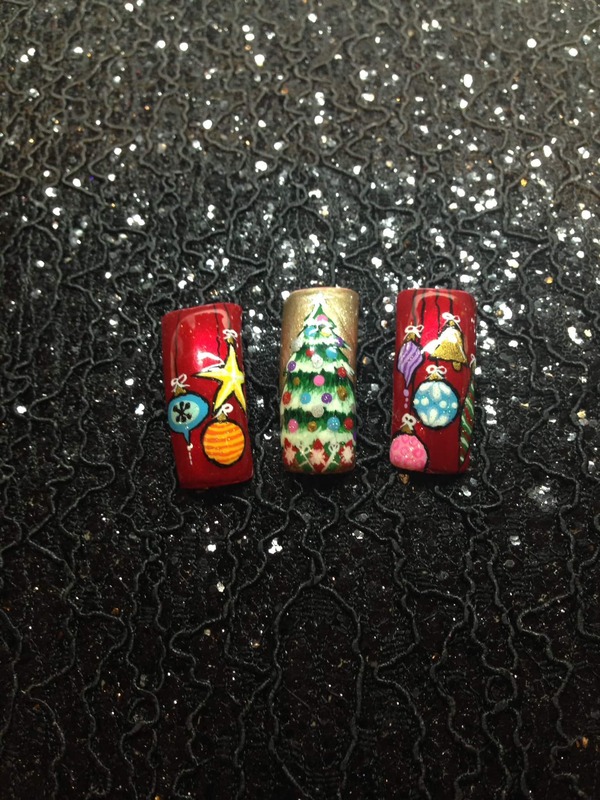 Click here to a video tutorial of how Sherri created these nails. For these nails I wanted something bright and fun with a twist. My inspiration was a poison arrow dart frog. The colors and patterns of these frogs are amazing, and I thought they would look really awesome done in jewels! I chose one frog in particular for its beautiful colors and markings. With yellows, oranges, teals, and blues, these nails are bright and fun. And the markings make a statement. 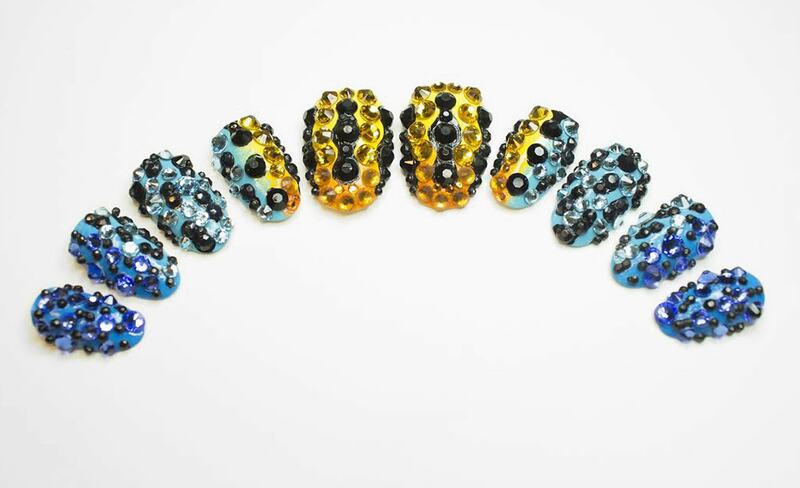 Even though these are based on frogs, I think they are beautiful nails on their own, and I hope everyone loves them! 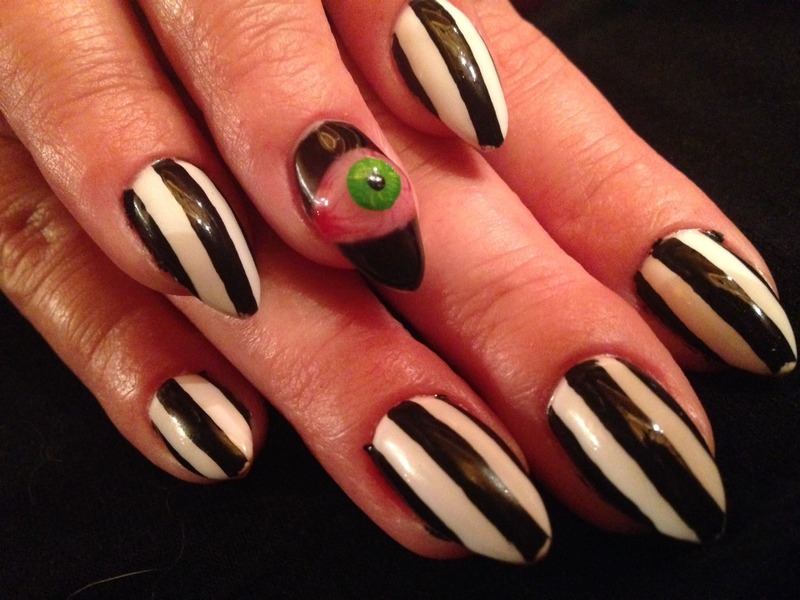 I wanted to keep these nails wearable, and ready to celebrate a momentous occasion. So I kept these strictly “Entity” by choosing my color palette from their logo and product line. I made the base a charcoal grey with metallic flake to pull in their logo and accented with pink and white elements to continue the theme. Of course, every party nail needs bling! So I chose pink and white Swarovski crystals to add some glints of light. To honor 10 years of Entity, I recreated the logo on the thumbs, and accented the pinkies with a pink 10, and a single clear Swarovski crystal. The one Entity ad that really spoke to me was the wings. 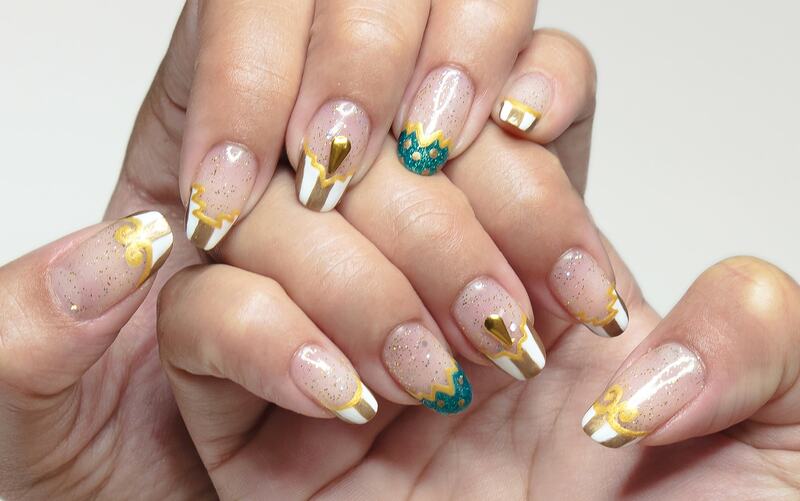 On these nails, they represent the ability for Entity to take off and grow in the next 10 years. 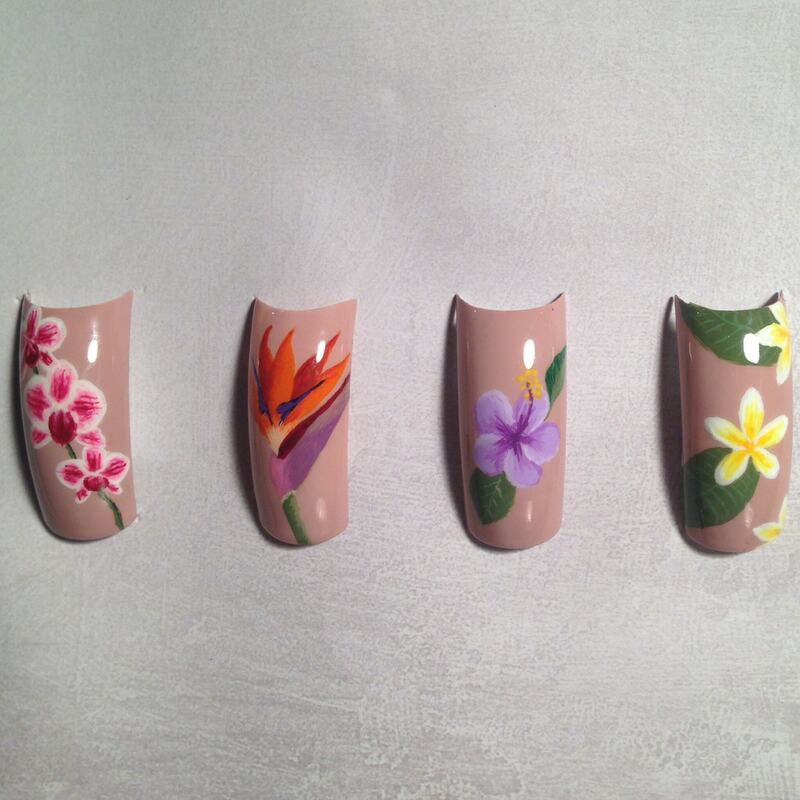 These were built feather-by-feather on the nail out of white acrylic. 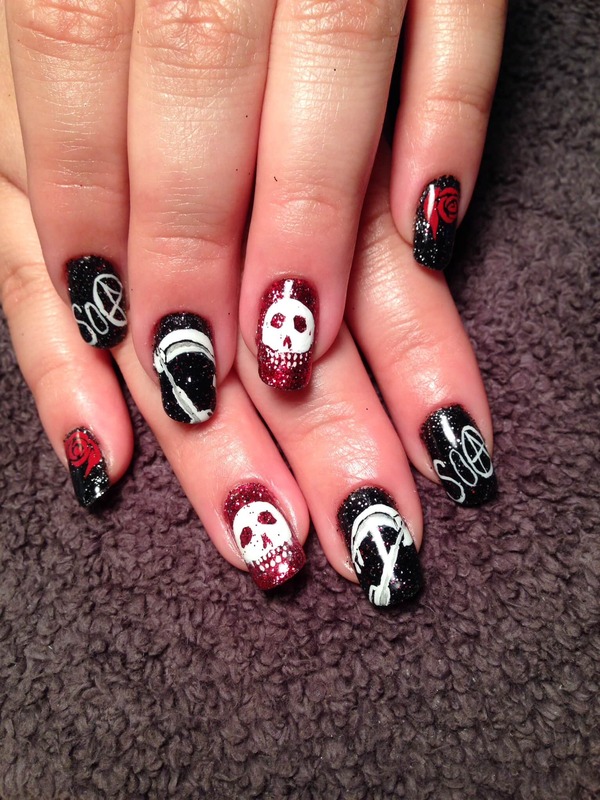 Click here to a step-by-step tutorial of how Sherri created these nails. I am Dutch, German, and a little bit of Scottish. I love the history behind my family and I am so grateful that someone mapped it out. I chose to put a flag from each country somewhere on the nails. 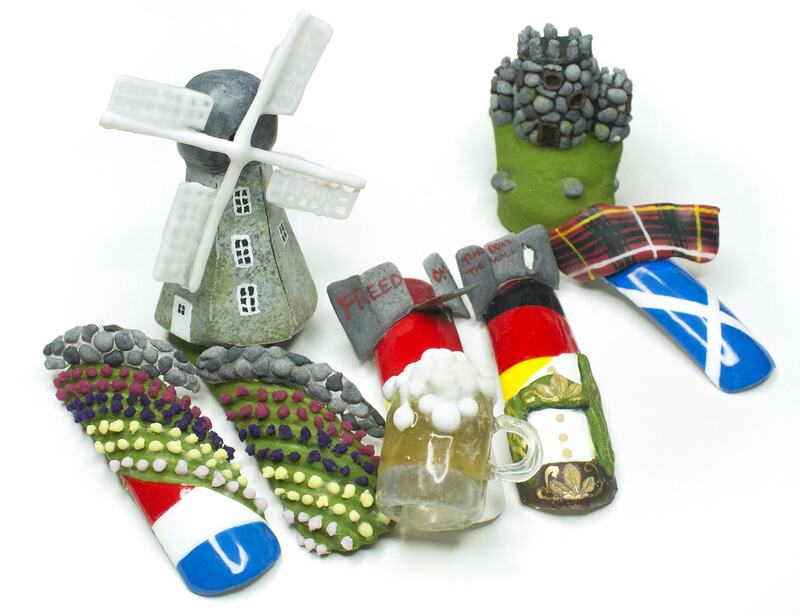 When I think of the Netherlands, I think of beautiful windmills and rows and rows of colorful tulips. For Germany I wanted to add the fun and the serious, so I added lederhosen and beer for Oktoberfest and the Berlin wall because that marks such a historical turn for Germany. Scotland is beautiful with castles and green hillsides. I am a descendent of King Robert DeBrus, so I had to have a castle. I also looked up the plaid my clan would have worn and painted it on a sash. I used acrylic, gel, and acrylic paint for this design. I love my heritage and was so happy to put it on nails. 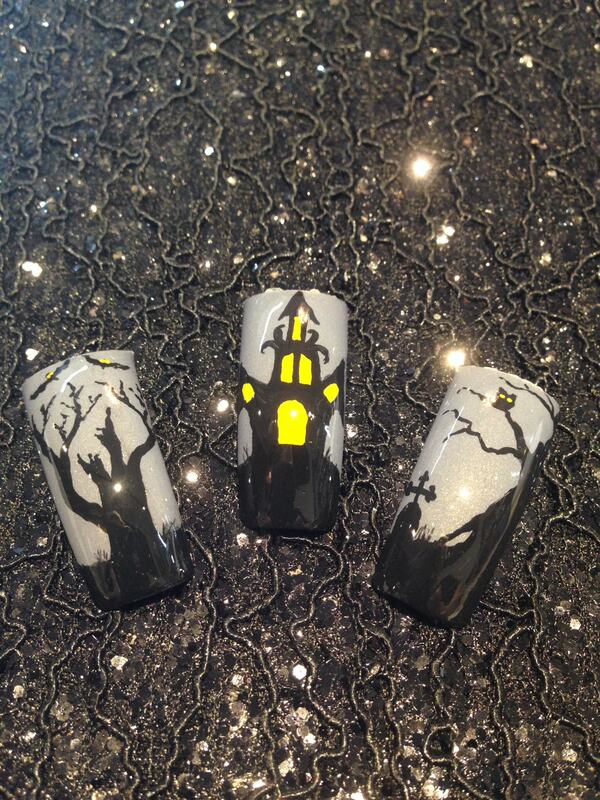 Click here to see a video of how Sherri created these nails. When approaching this challenge, I wanted to keep the versatility of the traditional French manicure, but update it to something that could be worn in 2014. 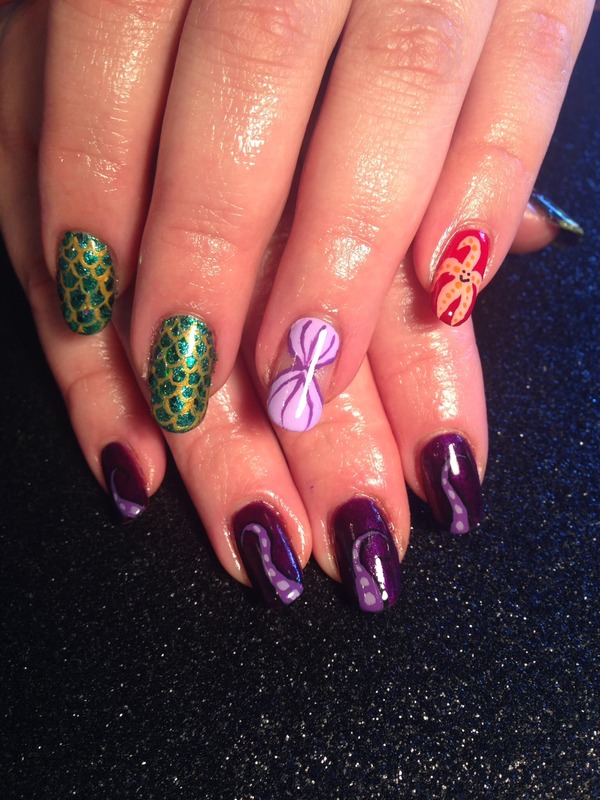 I wanted to create nails that could easily transition from workday to nightclub. So I didn’t focus on reinventing the French tip, but rather on how to make it fresh, trendy, and most importantly, something representative of Los Angeles, without going over-the-top. LA is known for being the movie capital of the world, and has some of the greatest movie houses in the world. Probably one of the most iconic of these is the El Capitan Theater at Hollywood and Highland. The sign inspired me with its bold lines, warm colors, and Spanish Baroque architecture. 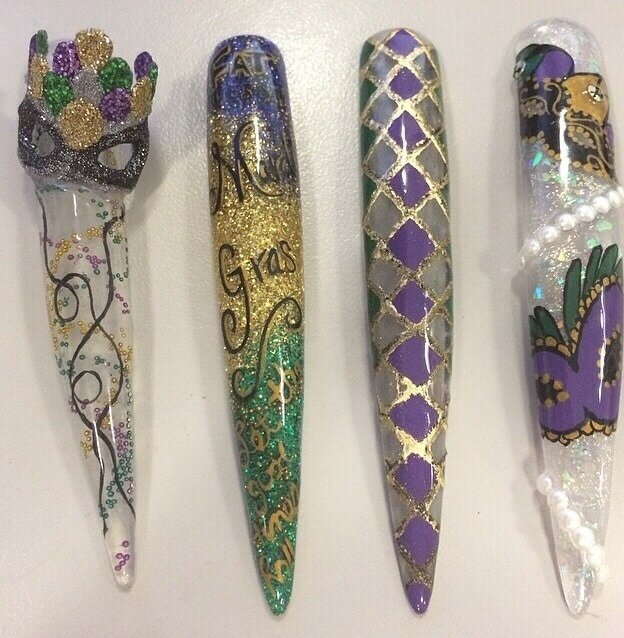 These nails would go beautifully with some trendy clothes, and a nice walk down Hollywood Boulevard! 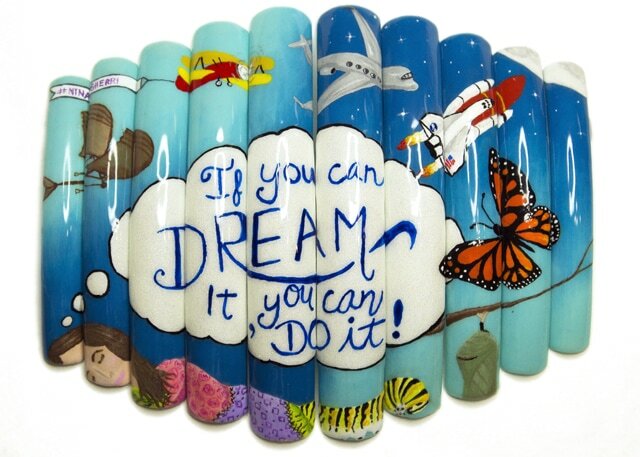 Click here to see a step-by-step tutorial of how Sherri created these nails. I created my sea monster using foil and clay as a base, and sculpted detail with sculpting gel. I got an LED light from the craft store and (I feel really bad about this part) drilled a hole in my monster’s head. I ran the light through the hole and coated it in gel. 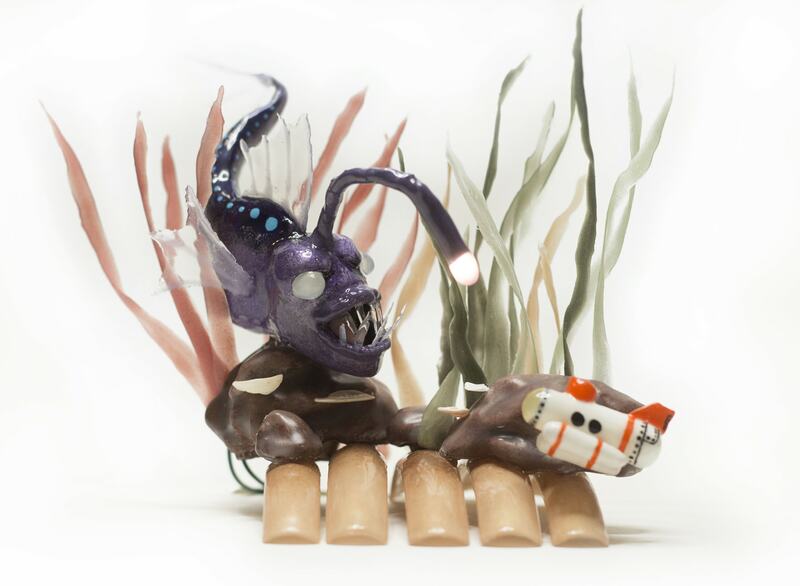 The submarine was made with a straw and sculpting gel. The seaweed was made using tinted gel wrapped around a C-curve stick. The rocks were made with foil coated in gel. Also small details were added with paint and real seashells. I loved this challenge and could have literally kept working on this for another two weeks. I love the ocean and I’m a huge supporter of oceanic animal rights. 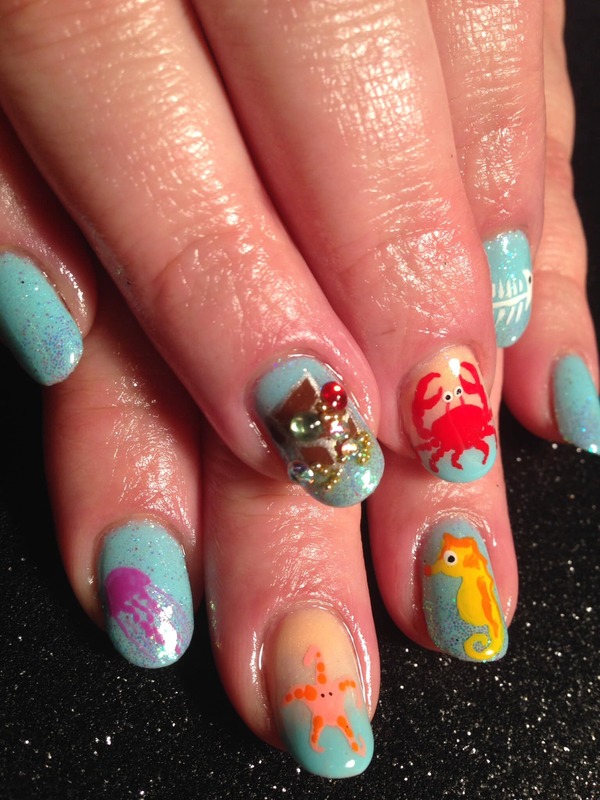 Thank you for letting me express my love of the ocean through these nails! Walt Disney once said, “If you can dream it, you can do it.” I’m a big fan of Walt Disney, and a lot of his philosophies on life. This particular quote of his describes my attitude toward everything. If you’ve already put the energy into dreaming something up, then it just takes one minor step to make it a reality. I’ve been saying since last year’s NTNA competition, “I can do this. Why not?” Then self-doubt started to put a damper on things, and I almost didn’t apply. These words reminded me that I had already dreamt it…now I just had to have the courage to take the first step to make it a reality. One of humanity’s dreams since time began has been flight. Until recently, it was just that…a dream. But many people who embody the “Dreaming is doing” attitude weren’t afraid to dream, and weren’t afraid to step out and act on those dreams. Beginning with Leonardo DaVinci’s first sketch of his flying machine, a great adventure took place that allowed humans to break the bonds of gravity and soar…eventually allowing us to touch the stars. None of it would have been possible if someone hadn’t taken the first step to realize that dream.